Bidspirit auction | DE COMINES, PHILIPPE. Les Memoires. Edited by Denys Godefroy. Family-tree at end. A wide-margined copy. Lightly foxed. Contemporary calf gilt, rubbed, spine worn. Folio. 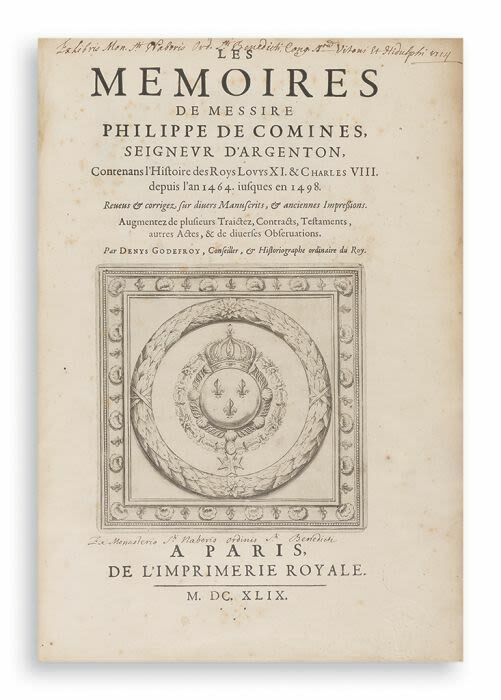 Philippe de Commines (or de Commynes, or Philippe de Comines; Latin: Philippus Cominaeus; 1447 -1511) was a writer and diplomat in the courts of Burgundy and France. He has been called "the first truly modern writer" (Charles Augustin Sainte-Beuve) and "the first critical and philosophical historian since classical times" (Oxford Companion to English Literature). Neither a chronicler nor a historian in the usual sense of the word, his analyses of the contemporary political scene are what made him virtually unique in his own time.